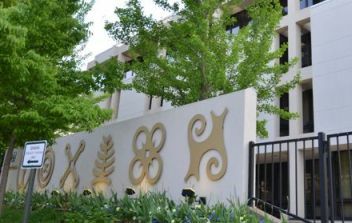 Adinkra symbols grace the front of the Ghanaian Embassy 3512 Independence Drive, N.W, Washington, DC. Adinkra symbols were originally printed on Ghanaian mourning cloths. Today the symbols are seen on many types of objects.